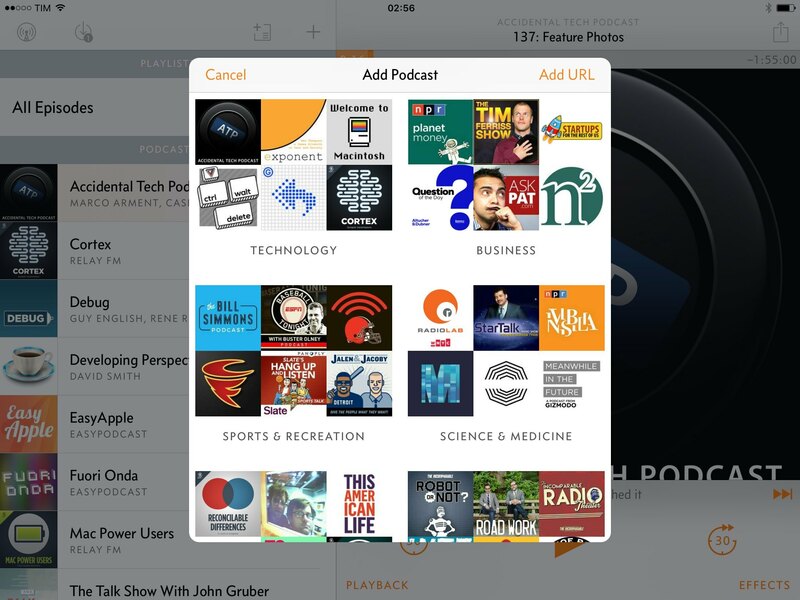 As I guessed in my iOS 9 review, the temptation to go back to Overcast has been stronger than the allure of Apple's refreshed Podcasts app. Released last year for iPhone and later ported to the iPad, Marco Arment's podcast player launched with an elegant design and the distinctive Smart Speed and Voice Boost, two audio effects that allowed users to save time when listening to podcasts by shortening moments of silence, and enjoy a superior audio quality. In using Overcast for the past year, Smart Speed has turned from a simple and clever addition to a lock-in factor for daily listening: I know that Overcast will make shows I listen to shorter without making them sound odd or unnatural, and it's the kind of feature that I can't enjoy in iOS' built-in Podcasts app. Apple's player has gotten considerably better on iOS 9; but, when looking at the total amount of hours saved with Overcast, I realized that those are hours of my life I got back by using Arment's app instead of an alternative. This, combined with the many thoughtful touches of its interface, makes me happy to stick with Overcast. Arment faced two problems, though. 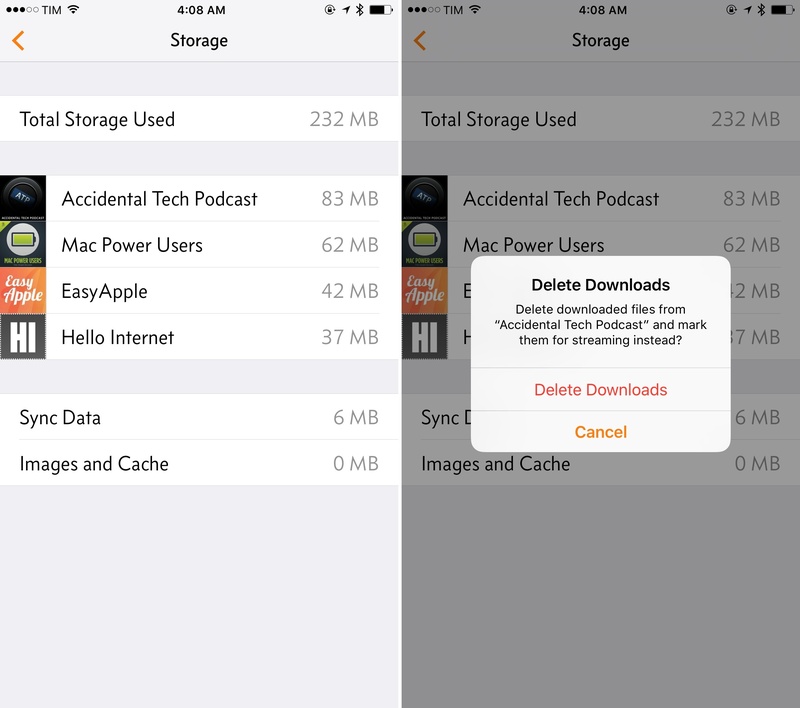 Overcast always needed to download new episodes before playing them: due to limitations of iOS 7's web download and audio APIs, Smart Speed and Voice Boost couldn't work with streaming – a popular feature that many podcast apps implement to avoid taking up storage on users' devices with downloaded audio files. And, while it was Arment's goal to gain market share with a freemium model that made Overcast free to use with an In-App Purchase to unlock advanced features (such as unlimited effects), the majority of Overcast users ended up staying on the free tier – a less capable version of the app that Arment himself wasn't using, and which couldn't be easily differentiated in a sea of podcast clients for iOS. 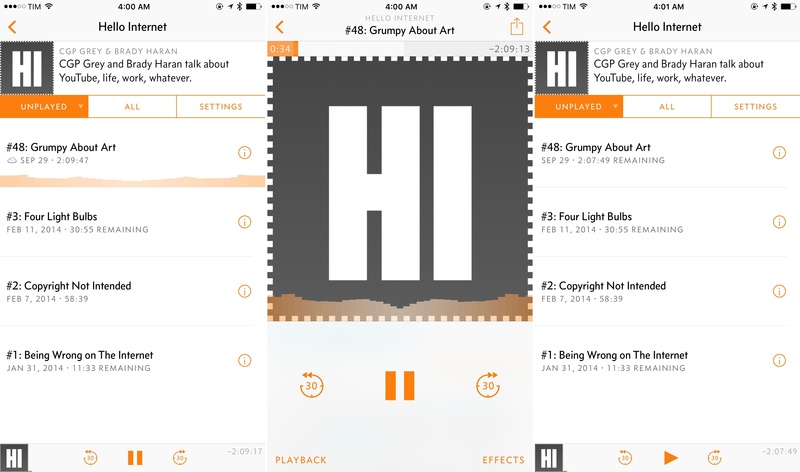 Overcast 2.0, launching today on the App Store, fixes both problems. With version 2.0, Overcast users will be able to stream episodes and use audio effects at the same time, getting the same experience of Overcast 1.0 with no upfront download required. But more importantly, Arment is taking a bold step with pricing: Overcast 2.0 is a completely free app, with an optional patronage model to support Arment directly. Streaming an episode in Overcast, which is then available as a downloaded file (the cloud icon disappears). When streaming, you'll notice that the progress bar will show a light gray bar for the file's download, which means you can tap on any point within the buffered bar to skip without delays. This is an essential aspect of streaming in Overcast 2.0: there's no deciding between streaming and downloading because every stream is a download. Every time you tap on an episode that hasn't already been downloaded, it'll start streaming immediately and it'll stay as a download in the app for later. I'm a fan of streaming. Whenever possible, I stream everything and never download first: this has been true for music, podcasts, movies, TV shows, and other forms of online entertainment for years now, and Overcast was the missing piece in my stream-based media consumption workflow. I also appreciate the new storage options to see which shows are using storage with downloads on my device. In the age of 16 GB iPhones and decent Internet connections – I'm lucky enough to have good DSL and great 4G coverage here in Rome – I find downloads to be more problematic than they're worth, and I don't like it when apps start taking up valuable storage space with files they've been downloading in the background. I've been streaming with Overcast 2.0 since the first betas earlier this year, and it's been fine. I like that I don't have to remember that downloads are happening in the background; you can always go back to old-school automatic downloads for every subscription if streaming isn't for you. New in Overcast 2.0 is also support for chapters, which let you jump to a specific section of an episode, as marked by the podcast's author. While Arment wrote in January (six months after Overcast's launch) that most listeners didn't seem to demand them, Overcast 2.0 offers support for common chapter formats (Enhanced AAC and MP3 Chapters) with an updated playback UI to select and navigate chapters. I don't listen to my favorite shows with chapters: I prefer to get the entire context of a conversation with an uninterrupted listening flow, and I've never found myself wishing Overcast supported chapter marks. However, now that the app does have chapter support, I have to admit that it's well done and I have occasionally found chapters to be useful when going back to a specific section of a show I've already listened to. I'm not listening to new episodes by constantly jumping around with chapters, but they have come in handy to share a particular section more easily or just find it again. The UI of chapters in Overcast isn't too complex, and the interactive timestamp list is obvious and well integrated with show notes. In Arment's typical attention to the smallest details, the episode's share menu has been updated with chapter integration, too. 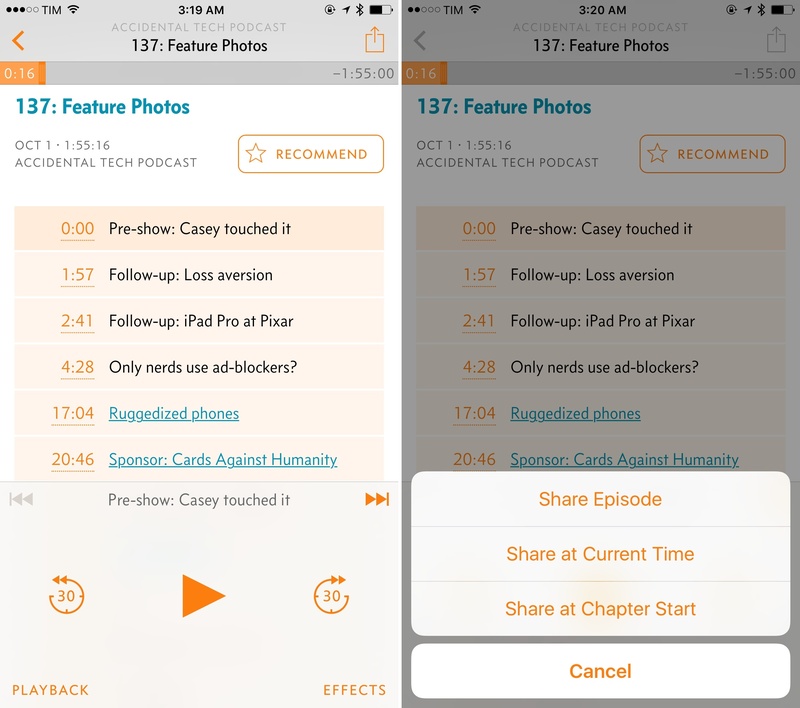 For chapter-enabled shows, sharing will offer a third 'Share at Chapter Start' option that will set the timestamp to the beginning of the chapter as marked in the audio file. When Overcast launched last year, it featured a curated collection of starter kits. In each one of them, Arment had handpicked a selection of editorial recommendations – podcasts pertaining to a category which he believed were worth people's attention. With Overcast 2.0, these editorial selections are (mostly) going away and they're being replaced by a source which is unique to the app: recommendations from Overcast users. In Overcast 2.0, categories show the most recommended podcasts for the past week. Both visually and functionally, there isn't any difference from the starter kits of Overcast 1.0, but by relying on Overcast users and data from the last 7 days, recommendations should be more diverse and relevant. This has the advantage of incentivizing users and podcasters to promote Overcast recommendations: as the app gets more popular, recommendation-based categories could become another avenue for discovery, pushing everyone to recommend episodes in Overcast to attract new listeners each week. Editorial picks aren't going away completely, though – Arment is still curating starter kits for networks such as Relay FM and The Incomparable, which are available at the bottom of the page. At the top, recommendations from Twitter are more prominent in this release, and they continue to be my favorite way to check on recommended episodes from people I follow on Twitter. With version 2.0, Arment is making everything in Overcast 2.0 free for everyone. Gone are the limitations to audio effects and the In-App Purchase to unlock more features with a one-time fee: instead, you'll now be able to directly support the continued development of Overcast with a recurring subscription by becoming a patron. When something is given away for free on the App Store, most people will be perfectly content with it. According to Arment, 80% of Overcast users were running the free version of the app, which didn't offer the effects and advanced options that made Overcast stand out from its competition. And with the majority of its user base using the (inferior) free version, Overcast ultimately couldn't be as differentiated as Arment hoped it would be. The free Overcast gained market share, but not in the way Arment preferred. The new plan in Overcast 2.0 is to let users decide whether they're willing to support the app by paying or not. To become a patron, you can go to Overcast's Settings > Support Overcast and choose one of the three subscription options: $2.99 for three months, $5.99 for six months, or $11.99 for a year. How to become an Overcast patron. Arment is being extremely upfront about what Overcast's patronage gets you in addition to the app: nothing. 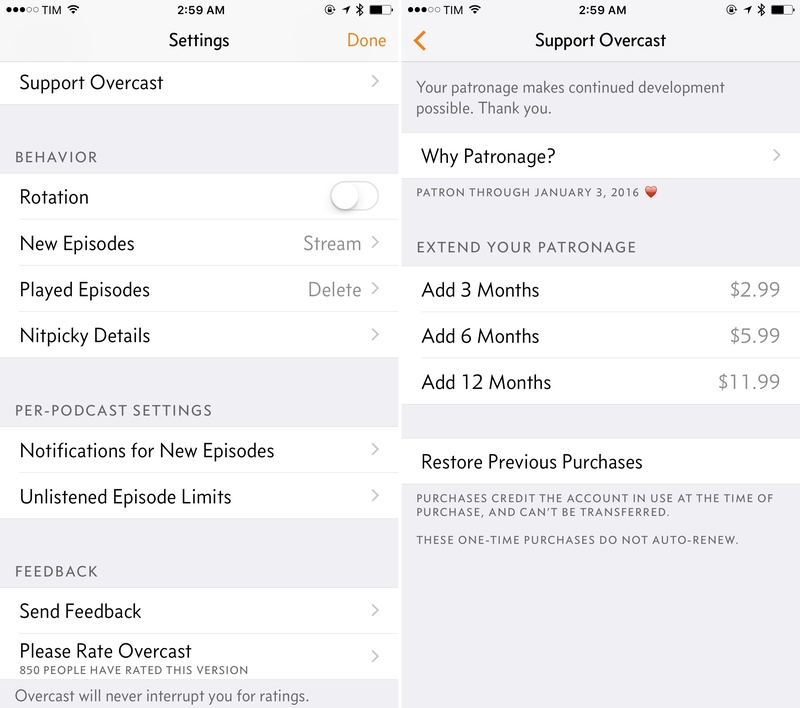 While patrons may get special features in the future if Arment can't afford to offer them for everyone, today patronage is simply a way to support Overcast directly because you want to. The app isn't annoying about paying and there are no prompts that disrupt the experience when using the app. Everything is communicated clearly, with a personal note from Arment in the settings. I don't know if Arment's new strategy will work – he says that if only 5% of customers become monthly patrons, Overcast will match its previous revenue – but I think it makes sense. Overcast was created with the intent of providing a superior podcast player for everyone. By having a free app with an optional In-App Purchase, Arment managed to get a good conversion rate out of free customers. But, maximing revenue wasn't the only goal – gaining market share was, too. However, market share for podcast clients is, in my opinion, highly dependent on differentiation: if it doesn't provide exclusive features that are substantially better than another app (possibly an Apple one), people are just going to stick with what they know, or try a free alternative. 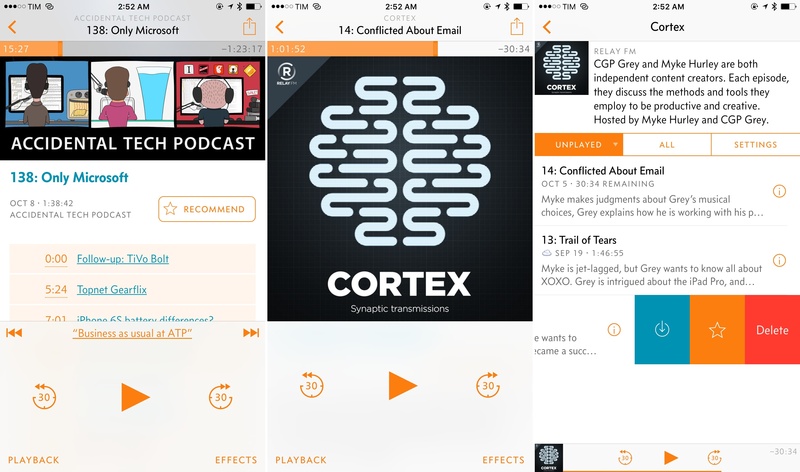 The best features of Overcast – the ones that make it a useful and unique podcast player – were only accessible by paying, which limited the scope of the app's utility for a lot of potential users. By going free, Overcast can expand its user base, and hopefully 5% of customers will find the app important enough to support it with monthly donations. It'll be interesting to see how Overcast users will respond to this, but I have a good feeling. Overcast 2.0 looks like the same Overcast you've known and loved for the past year. And it is. But under that unassuming nature lie important technical enhancements and a revised strategy that bode well for Overcast's future. There are some apps where a single feature is enough to keep using them in lieu of default options. Overcast is a collection of thoughtfully considered, painstakingly engineered features which I can't get anywhere else. Apple's improvements to its Podcasts app brought a breath of fresh air in iOS 9, and they will serve millions of customers well, but I keep listening to my favorite shows with Overcast because it gives me what I want. Smart Speed, Twitter recommendations, and the Now Playing screen aren't just features on a checklist: they breed a listening experience that matches how I expect to listen to podcasts. On the surface, as an Overcast patron, I won't get anything concrete in return. But in reality, Overcast has already given me back hours of my life thanks to Smart Speed. I think that's worth paying for. Overcast 2.0 is available on the App Store. For this review, I was able to ask Marco Arment a few questions about Overcast's new patronage model and the future of the app. You can find the unabridged interview below. Federico Viticci: When did you realize that you wanted to switch to a patronage model for Overcast? Was this a hard decision for you? Marco Arment: I’ve been thinking about it for a while. Since only about 20% of users have paid to unlock all of the features, it always bugged me that the vast majority of Overcast’s users were using a severely limited, pretty mediocre version of the app. The same problem bugged me with Instapaper five years ago. The outcome back then was different — I went from having free and paid versions to just a single paid version — but the goal was the same: to unify the product into one, unlimited, great app for all of its users. If you have a free version of your app, that will be the only version many people will ever see. So, for the Free users, that app — that extremely limited app that lacks almost all of Instapaper’s best features — is what they think Instapaper is. I was giving them a choice: Stick with this limited app, or upgrade to the paid version with all of these great features. But since they had never used those features, they didn’t know how much they wanted them. And choosing which features to put into Free has always been very difficult. If I give it too much, I risk wrecking sales of the paid app. If I give it too little, I further harm Instapaper’s image among all of these people. Almost all of that applies to Overcast today. But this time, since market conditions are different and my goal is to serve the most people, I’ve decided to consolidate into a single free app rather than a paid one. FV: In your mind, what's the advantage and the potential downside of making Overcast free and relying on support from patrons? It’s also more competitive. Overcast’s biggest competitor by far is the Apple Podcasts app that’s included on every iPhone, and it offers all of its features to everyone for free. It’s possible to compete with a free, ubiquitous app with your own paid alternative, but it’s much harder, and new customers always need to get past the big psychological hurdle of paying for an alternative to something that they already have for free. By going completely free, I remove a major barrier that was keeping a lot of people from switching to Overcast, and I eliminate price as a factor on which other apps can compete with mine. The potential downside is obvious: I’ll probably make less money, especially at first. But as long as I still make enough, I’ll accept that tradeoff. FV: A free and full-featured Overcast, I think, should make it easier to reach a wider audience and let more people enjoy the real app. 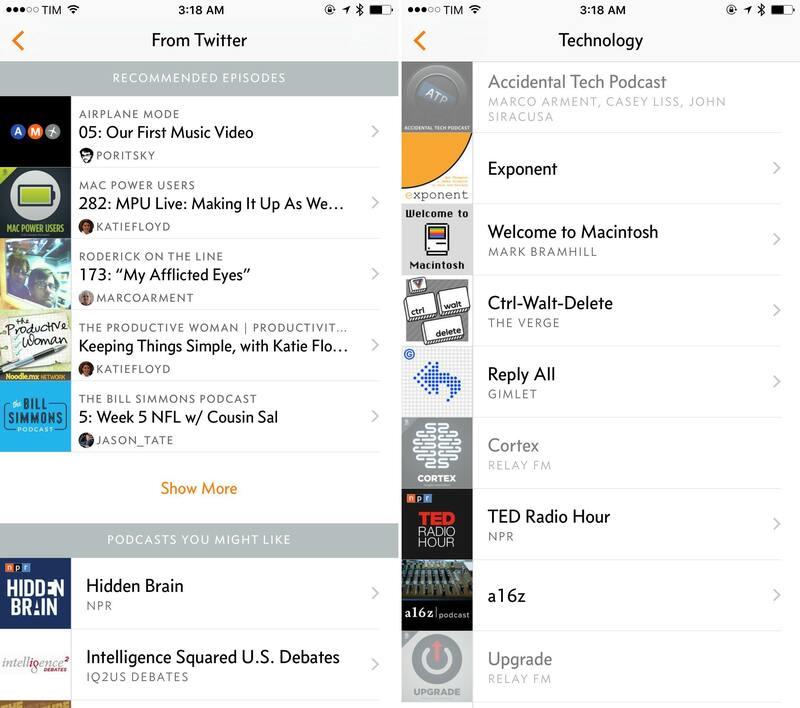 However, the majority of iOS 9 users could also be served by an improved Podcasts app by Apple. More than a year into Overcast, are you still struggling to balance power user features with a desire for a bigger audience that may not need those features? MA: Features aren’t the only reason (or even the primary reason, as far as I know) that people choose Overcast over other apps. An app as complex as a general podcast player is the combination of thousands of tiny decisions along the way, resulting in a strong personality and countless implementation details that will resonate with certain people and conflict with others. It’s important to accept this and optimize for it. I’m never going to win over everybody no matter which features I add, but I do run the risk of alienating my customers and ruining the app’s personality if I add too many features (or the wrong features). There are a few features, like streaming, that are important enough that I must implement them to expand my market because so many people require them. But most of the time, the way to expand my market is to simply make the app better and spread the word more, neither of which necessarily involve new features, and ensure that I don’t turn the app into something that will drive away the people who like it. FV: Is streaming in Overcast 2.0 made possible by iOS 9? MA: No. Streaming was developed completely on iOS 8, but I’m requiring iOS 9 for the final app for nicer UI code and reduced maintenance complexity, especially since iOS 9 didn’t drop support for any older hardware. FV: With so many companies moving to an editorial, highly curated approach for news and other media content, I find your decision to stop handpicking shows interesting. Why are you stepping away from your editor role in Overcast's recommendations? MA: Because, quite simply, the recommendations-driven categories are finding more great podcasts, faster, and with more diversity than I ever could as one person who listens mostly to tech shows. FV: Looking ahead, do you see Overcast continuing to gain functionality on other platforms like Apple Watch, and maybe Apple TV? MA: Probably. It's an issue of utility and priority. Today, most people listen to podcasts on a single device, and it’s usually an iPhone. But that may change over time. Maybe an Apple TV app could help bring podcasts out of people’s headphones and become people’s living-room entertainment. But today, working on a TV app for an audio-only media player sounds risky. The Apple Watch poses a different challenge: It’s very difficult for a watchOS podcast app, even for watchOS 2, to be as fast and useful as just using the built-in Now Playing glance to control playback, and taking your phone out for anything more complex. This will likely improve over time as the Watch hardware and software advance, but it may be a few years before Watch apps are really compelling. And it may never happen — I love the Watch’s other features, but I’m not sure the ergonomics and hardware realities of smartwatches make for a very useful app platform. Both the Apple Watch and the new Apple TV also have the significant downside that they’re starting with very small userbases. Any work I do on Overcast for these platforms will only benefit a small fraction of the userbase. 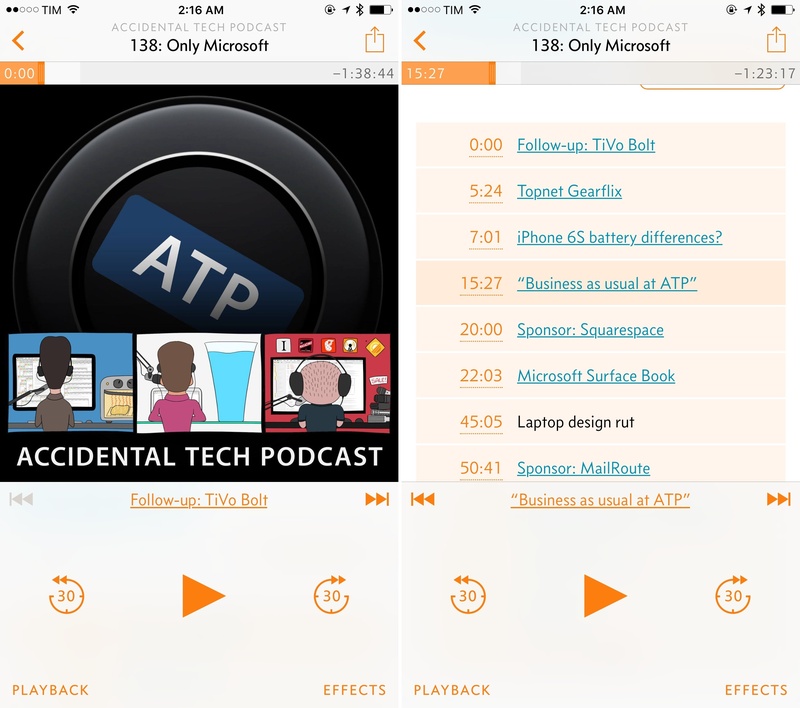 But if I work on the iPhone app, it benefits nearly everyone who uses Overcast. So for now, I’m being very conservative with investing time in the new platforms, and the iPhone app remains my top priority.